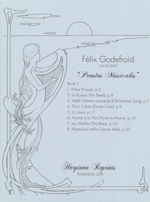 The two collections are ideal introductions to romantic music, simpler than Hasselmans or Renié musically, yet opening a door into the enchanting sound world of Godefroid, whose main characteristic is to bring out the singing quality of the harp. These great learning pieces increase gradually in difficulty, giving students of all levels something attractive to work on, and providing working harpists with Victorian-style repertoire for recital encores, or special occasions ranging from weddings and parties to church services and funerals. In Volume 1, Prière is a simple and peaceful Andantino religioso with only four pedal changes. From the middle of the 19th century, France developed an outwardly very secular outlook, while simultaneously “hosting” visionary saints like Bernadette of Lourdes and later Theresa of Lisieux. A new genuine religious sentiment not necessarily bound to the Church permeated the culture in private life, affecting many musicians, Gounod, Massenet and Franck, for example, in their subject matter and musical inspiration. In Le Roseau, a reed gently sways in the wind, with a sweet melody rising from a texture of arpeggios and rolled chords, briefly veering into minor, as if letting out a sigh, then returning to a sunny disposition. Vieille Chanson normande, more rhythmic in character, opens cheerfully, giving the left hand a steady, flowing accompaniment. It alternates moodily between major and minor, yet ends with strong determination. Divin Calme is a lovely meditation traversing many different states of mind, from surrender to dreamy fervor, with much dynamic contrast. La Laura was dedicated to a young lady called Laura and is filled with little flights of fancy in her honor. Hymne à la Paix sings deeply of the wish for peace, as war and social unrest dominated events in Europe from 1870 onward. The poignant hymn is carried forth by large rolled chords in 6/8, twice interrupted by pleading motives attempting to gain traction. Les Abeilles requires utmost lightness of being with magic little fairy fingers to convey the charm of this nature scene. On p. 18, first system, third measure, there is surely some mistake in the accidentals. It is recommended to keep the notes f and c flat in this specific section. 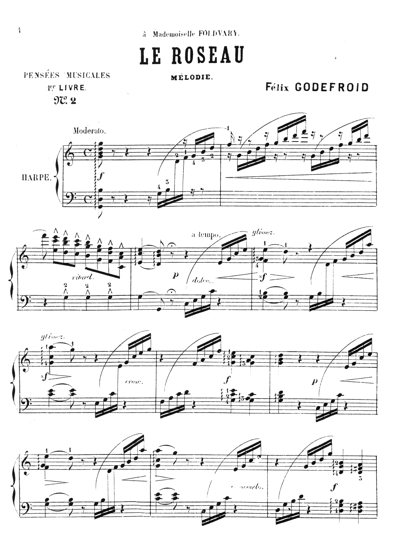 Mystérieux Vallon is surely the most enticing song of happiness, Godefroid’s signing off on an enchanted dream that must be made to last… The technique grows more sophisticated, when the main theme returns adorned with arpeggios, and the left hand reaches over the right to complete the pattern.